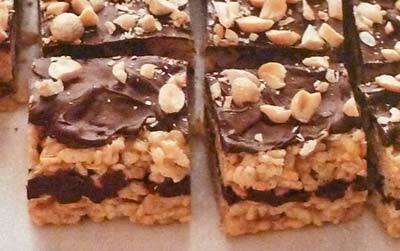 Rice Crispy Squares are a favorite treat of both young and old. They bring out the kid in everyone. When I was with my 91-year-old grandmother recently, she was talking about wanting to make a batch of these yummy crunchy and crispy squares! Do you remember the first time you ate Rice Crispy Treats? Or the first time you made Rice Crispy Squares? We first made them in Girls' Club and Girl Scouts ages ago. According to Wikipedia, Mildred Day and her staff at Kellogg's invented the original crispy rice treats in 1939 and Kellogg's published the recipe two years later. Rice Krispies Treats are more popular now than they were then. 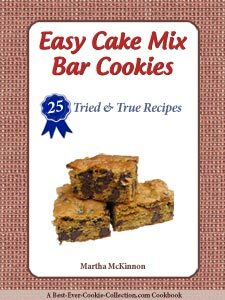 You can even buy them already prepared, but there really is no need to when nothing could be simpler or cheaper than whipping up a homemade batch from scratch. 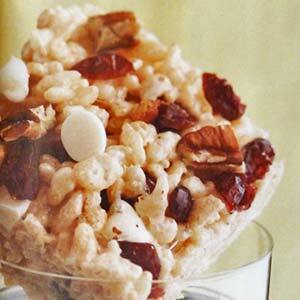 With only three ingredients, rice crispy treats are quick and easy to make and fun to eat. They are terrific for birthday parties, picnics, and backyard barbecues. The next time you have guests in for dinner surprise them by serving a plate of rice krispies treats for dessert! Line a 9X13-inch baking pan with parchment, waxed paper, or foil and coat with non-stick cooking spray and set aside. In a large saucepan, melt the butter over medium-low heat. Add the marshmallows and stir until the marshmallows are melted. Gently stir in the cereal and continue to stir until the cereal is coated with the marshmallow mixture. Flatten gently with a cooking spray coated spatula, a piece of waxed paper, or your clean cooking spray coated hand (really the best cook's tool anywhere). Let the rice crispy treats cool completely and cut into desired size squares. This recipe makes one 9x13-inch pan of Easy Rice Crispy Squares. Use cocoa flavored crispy rice cereal in place of plain crispy rice cereal. 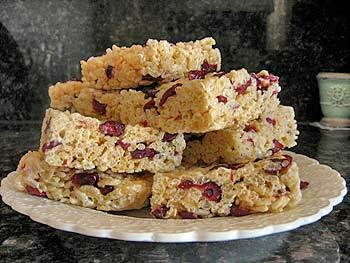 Use brown crispy rice cereal and add 1/2 cup dried cranberries or raisins for healthy fruity rice crispy treats. Stir 3/4 cup creamy peanut butter into the marshmallow/butter mixture before adding cereal. Stir 2 tablespoons instant coffee into the marshmallow mixture before adding the cereal. Stir 1 1/2 cups of small candies, such as mini chocolate chips, small gummy bears, or jelly bellies, when you stir in the cereal. Add 1 to 1 1/2 cups crushed Oreo Cookies when you stir in the cereal. 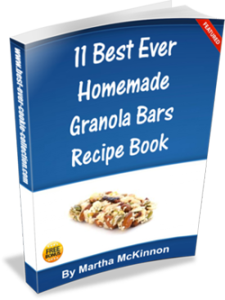 Drizzle cooled bars with melted milk chocolate or melted dark chocolate. Stir in the desired amount of nutmeg or cinnamon. Gently stir in crispy rice cereal, white chocolate chips, dried cranberries, and the 1/2 cup finely chopped nuts until well combined. Scoop mixture into the prepared pan. Flatten gently with a cooking spray coated spatula or spoon, a piece of waxed paper, or your clean cooking spray coated hand (really the best cook's tool anywhere) and press evenly into pan. 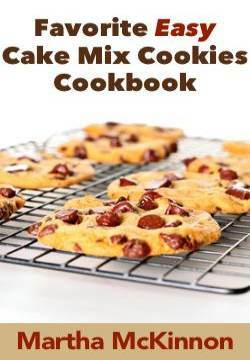 If desired, drizzle with marshmallow topping and sprinkle with additional chopped nuts and white chocolate chips. Store crispy treats at room temperature, in airtight container between sheets of waxed paper, for up to 3 days. In a medium saucepan, melt 1 tablespoon butter over low heat. Add 1 1/2 cups tiny marshmallows, stirring until melted. This recipe makes one 9x13-inch pan of Cranberry Rice Crispy Treats. Line a 8x8-inch square baking pan with parchment, waxed paper, or foil and coat with non-stick cooking spray and set aside. In a large pot, combine marshmallows, peanut butter, butter and salt. Cook over medium heat, stirring until melted, about 4 minutes. Remove from heat and add cereal; stir to combine. With a lightly greased wooden spoon (i.e. lightly spray with cooking spray), press half the cereal mixture into prepared pan. Spread half the melted chocolate evenly over cereal layer. Press remaining cereal mixture into pan on top of chocolate layer. Spread remaining melted chocolate on top and sprinkle with chopped peanuts. Store in airtight container between sheets of waxed paper, for up to 3 days. 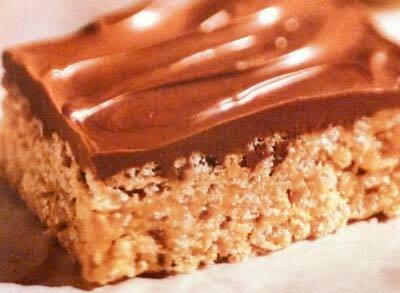 This recipe makes one 8x8-inch pan of Peanut Butter Chocolate Rice Krispies Treats. Line a 13x9-inch baking pan with parchment, waxed paper, or foil and coat with non-stick cooking spray and set aside. In a large saucepan, combine granulated sugar and corn syrup and bring just to a boil over medium heat, stirring constantly. Press evenly into prepared baking pan. Microwave chocolate and butterscotch chips in microwave-safe bowl on High (100%) power or 1 minute then stir. Spread melted chocolate and butterscotch mixture over cereal layer. Chill in pan for 20 minutes or until firm.